CHICAGO (AP) — Jason Hammel pitched six scoreless innings, drove home one run and scored another to lead the Chicago Cubs to an 8-1 victory over the Cincinnati Reds on Thursday night for their best start since 1969. 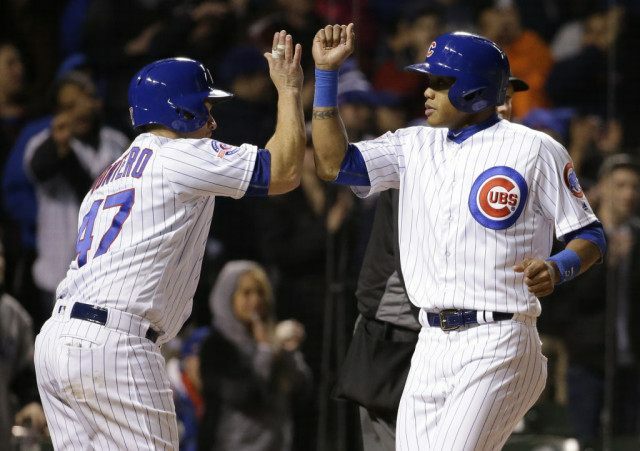 The Cubs swept the three-game series and improved to 8-1 for the first time in 47 years. They won 11 of 12 to start the ’69 season en route to a second-place finish. Dexter Fowler and Addison Russell had three hits each for Chicago, and Kris Bryant hit his second home run. Hammel (1-0) allowed four hits, walked four and struck out three on 88 pitches in chilly weather. Raisel Iglesias (1-1) allowed three runs on six hits and two walks over five innings. The Reds ended the shutout in the ninth against Justin Grimm, the last of three relievers. Bryant hit a solo homer on a full-count pitch in the second inning for a 1-0 lead. In the fifth, Hammel lined an RBI double, then scored on Ben Zobrist’s sacrifice fly. Chicago capped the win with a five-run eighth. Russell had an RBI single, Matt Szczur walked with the bases loaded, Dexter Fowler added a two-run single and Jason Heyward had a sacrifice fly. Cincinnati had at least one baserunner against Hammel in all but one inning, but none advanced past second. On Saturday, Reds pitcher Tim Melville will get his second major league start, and will do it in front of friends and family in St. Louis. “The people that saw me pitch in high school now will be able to see me pitch at the professional level. It’s very exciting,” said Melville, who played high school ball in nearby Wentzville, Mo. Melville called it a “great honor” to pitch on Jackie Robinson Day. In his junior year, he was presented the Jackie Robinson Award as the national high school player of the year. After seven starts at third base in the first eight games, Bryant made his first in left field. Reds: SS Zack Cozart and C Devin Mesoraco were not ready to start but available off the bench. “They are just a little stiff and coming off surgeries, so I just don’t have them in the lineup, but they are able to play,” manager Bryan Price said. … RHP Jon Moscot will be activated before his expected start against the Cardinals on Sunday. Reds: Melville goes against the Cardinals. In his big league debut — a 2-1 victory over the Pittsburgh Pirates — Melville pitched four innings and did not figure in the decision. Cubs: RHP Kyle Hendricks will start the opener of a three-game series against the Colorado Rockies at Wrigley Field on Friday. In his first appearance of the regular season, he limited the Diamondbacks to two runs in 6 2/3 innings in a 4-2 victory.